A lesson on how to improve a product without destroying what is loved. Here, there be madness…and batteries! Designing for a small, externally mounted resistive touch screen. 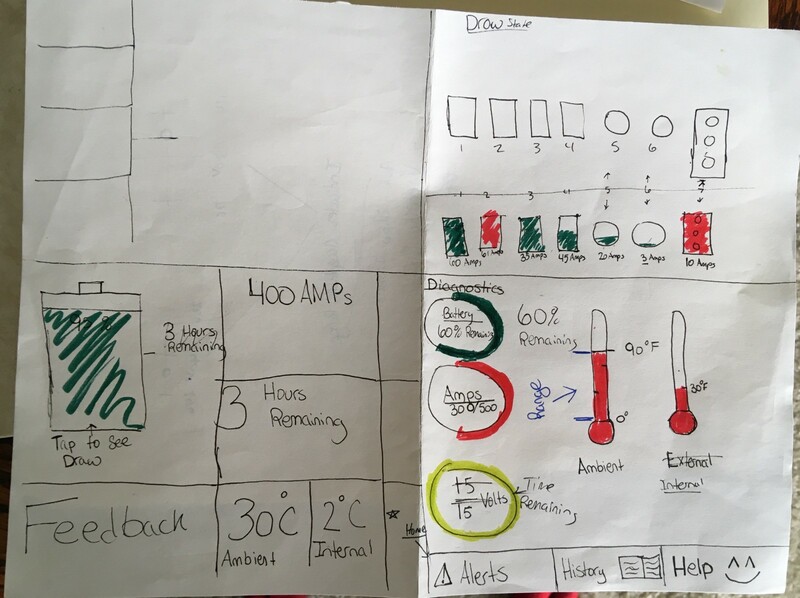 Designing a digital solution for a physical product. Today, I’m proud to unveil the first iteration of the digital dashboard for the Mobi Gen product line. “How do we design a useful, informative experience for Mobi Gen users while preserving what they know and love? 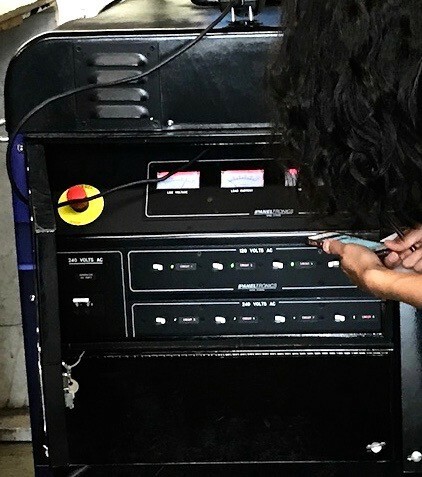 After witnessing and listening to the problems many users of both Mobi Gen and standard diesel generators had, we discovered common themes we wanted to help with. We met Mobi Gen when it was being used as an EV charger. The use case was different than that of a mobile power unit but still extremely useful. We learned a lot by following its primary technician around and pestering him with 1000s of questions. After walking around with the technician, we noticed some key opportunities in his workflow. One of the biggest opportunity areas we noticed was error feedback. The device needed to be cycled, yet 5 people including 2 employees and a manual had trouble restarting the device. It was clear to me this thing was going to need simpler, easier feedback methods. After our initial exploration session with the device, we needed to understand what the business was thinking about their market and product. What makes them feel they need a new interface? What are they trying to accomplish? 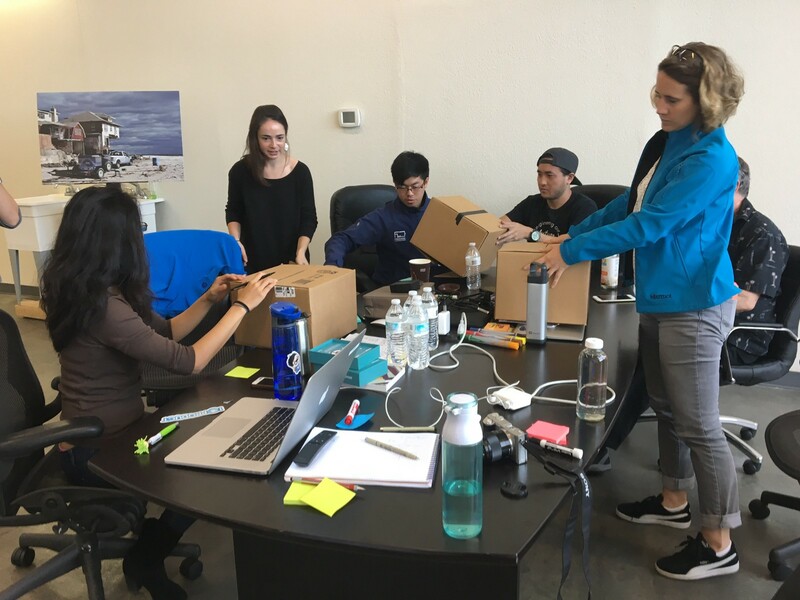 We held a with as many stakeholders as we could (VP of Product, Engineering, Brand, Research and 2 engineers). We utilized a few game-storming activities to draw their thoughts out. 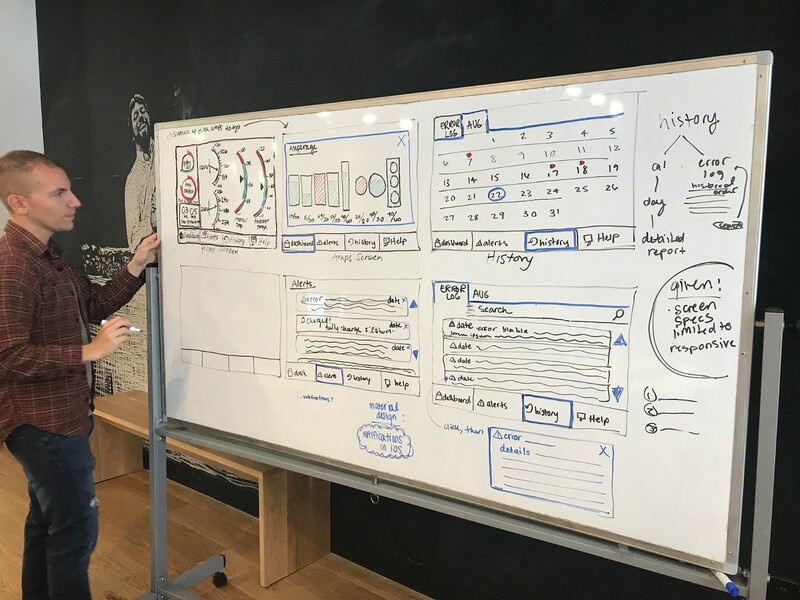 These activities allowed us to understand how the stakeholders felt a digital interface would fit into their product strategy. The main insight that came out of these sessions was that Mobi Gen was beloved, but confusing to its customers. After our visioning session, I invested a significant amount of time in understanding the science of power delivery. 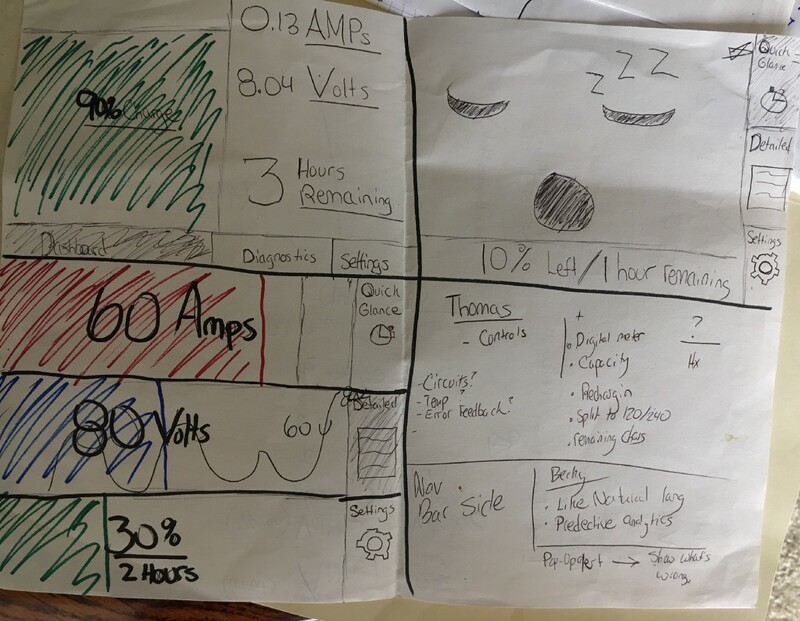 Understanding the difference between voltage, amperage, capacity, charge were all critical in producing a succesful design. YES! More Research, I know! But stick with me here. This is where it gets interesting. 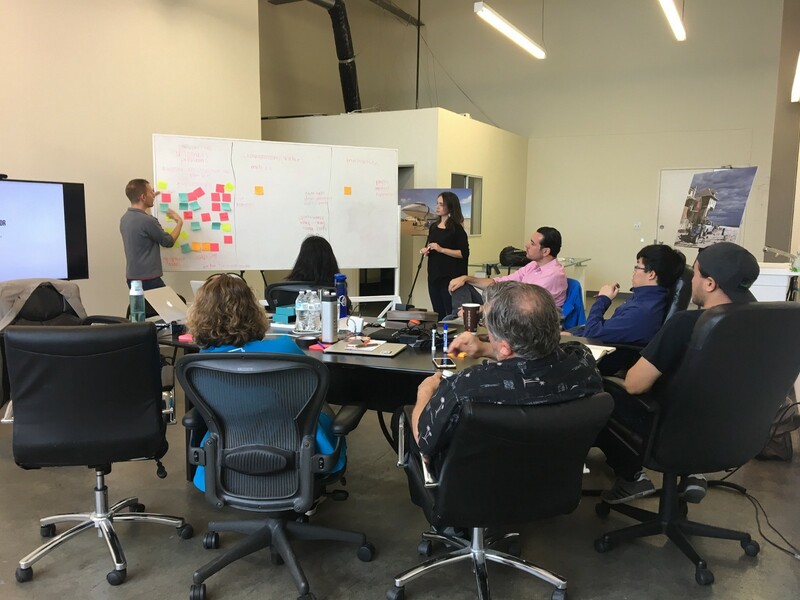 After our visioning session, we knew we needed to hear from customers who have actually used the product and contrast that information with customers who were considering using the product. Doing so would allow us to find areas of improvement and create a potential wish list of features that we could reflect in our “interface” (SPOILER ALERT, we made a dashboard, not an interface) design. In order to do so, we flew down to LA with our client to meet some end-users and potential customers. We went to CBS Studio City and met with lighting and technical gaffers. They REALLY did not want touch screen controls due to the chaotic, people-crashing-into-things nature of Film/Television sets. The current screen wasn’t working. CBS people felt it was too small and poorly placed (required bending-down to see, a large concern for them due to the ergonomic challenges this would pose). After that visit, we went to meet with the Google Facility Management Head of the Los Angeles Area. I couldn’t take pictures inside, so here’s my notes instead! 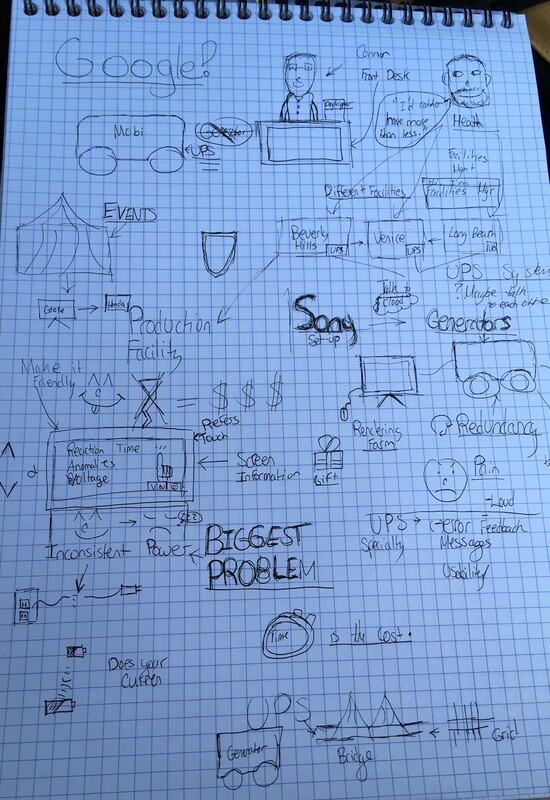 Visual notes, only I can read! After this meeting, we had our big A-HA moment! Make screen an enhancement, not a requirement. This creates a friendlier, safer user experience. 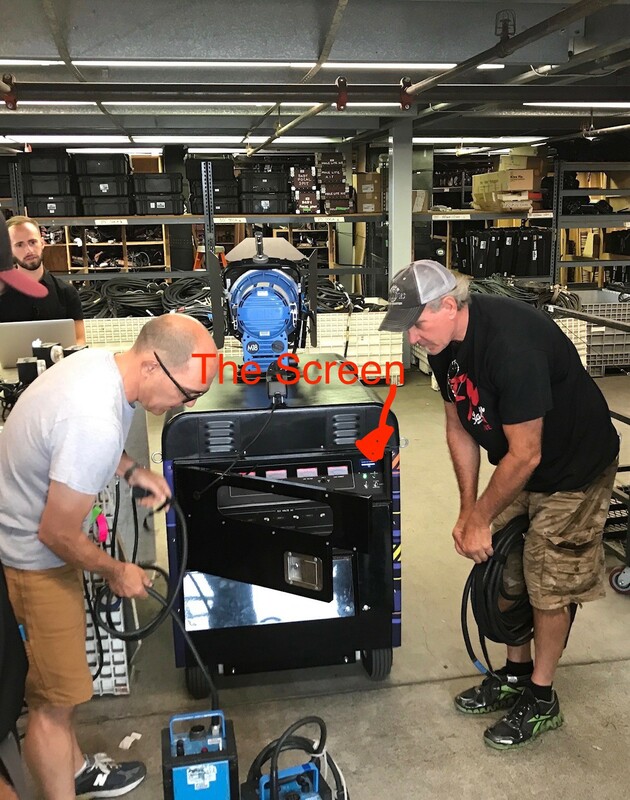 While we heard the Gaffers at CBS did not want touch screen controls, they consistently asked for a larger display with more detailed information. Our three other interviews (with Southern California Edison, Ian an Indpendent film maker and Obscura Digital) echoed similar information. Design Time, come on, grab your friends! During our research, we started sketching up some rough concepts with our users in a participatory design session. The first exercise, we divided a paper into 4 sections each and sketched up some concept ideas. Simple, chunkable and easily legible information (top left). Increasing communication of key criteria through graphics and color. Displaying more contextual information on the home screen. 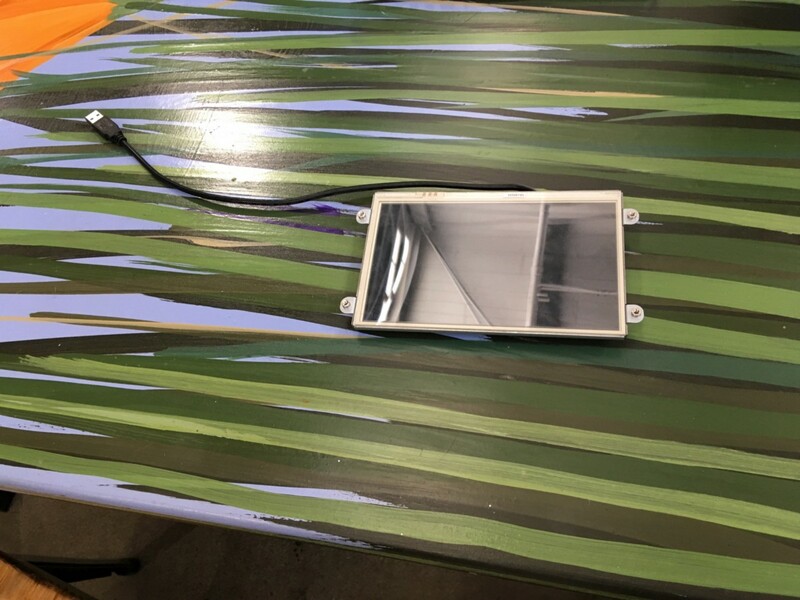 We showed our second iterations to FreeWire, who loved the circular display of information and the line draw screen seen in the top right (which appeared if a user tapped on the “amps” button. We took this idea and ran with it! 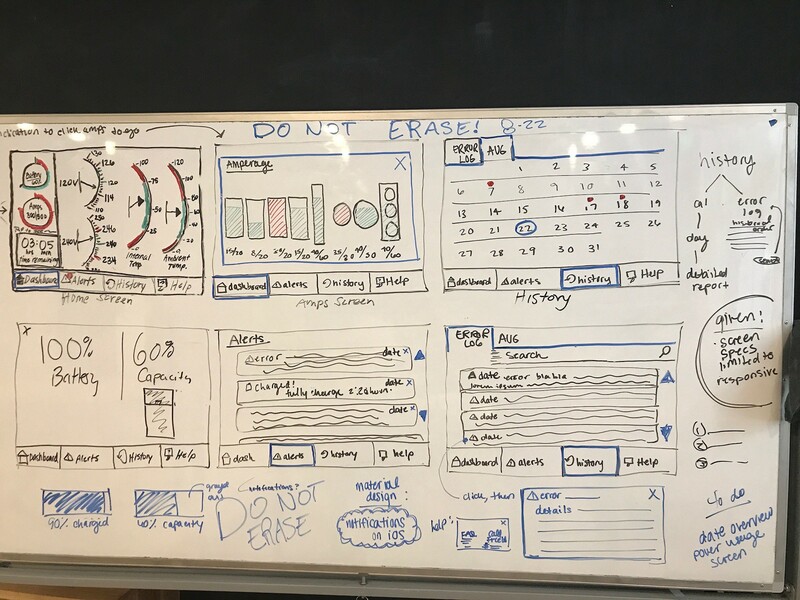 My team and I got so excited, that we blacked out and white-boarded everything in a design-induced frenzy! We got a bit carried away. Thankfully, we did solicited some quick feedback from some other experts in the field before we started wireframing. Our humble, resistive touch screen. We were trying to cram calendars, analytics, temperature gauges, and more onto a tiny 7 x 5 inch resistive touch screen. Given the size and constraints of the screen, we simplifed to what is in the gif belwo. By providing users essential information, reducing the amount of manual calculations (in terms of amperage and per-device amperage pull), focusing on learnability and providing contextual error-feedback, we created a friendlier (and more importantly) safer user experience. Our key impact in this project was really measured on feasibility and client satisfaction. FreeWire was ECSTATIC with the design. Not only did we create a friendlier user experience for their Mobi Gen through the dashboard, we actually helped demonstrate the full capability of the the product. The CEO of FreeWire stated he believes this design will have a large impact on the overall business, as their device can now communicate directly to its users. And after all, isn’t that what great design is about :)? Design really is powerful. Not only can it delight, but it can protect and educate! It (the design) doesn’t always have to be fancy to be amazing. Listen to what your users need. Not what you think they need. This is a continuing contract project. Updates will be posted down here to show successful design iterations as we move towards production.